The popular mouse adapter to use PS/2 mice on the C64 is back in an improved version. The already good 1351 mouse emulation was made even better and a Koala Pad mode and a Paddle mode were added. 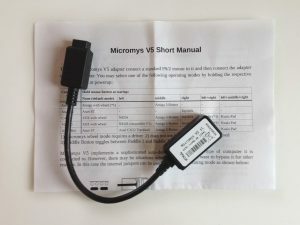 Micromys V5 can also be used with Amiga, Atari ST/STe/Falcon, VC-20 and 8-bit Ataris. Visit our Shop!